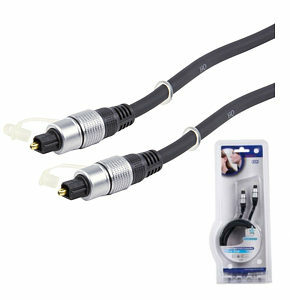 HQ Silver Series Toslink Digital Optical Audio Cable. Highly pure optical fibre conductor to prevent phase error and achieve high-fidelity transmissions. For smooth more dynamic digital recordings. Low density Poly-Ethylene insulation to reduce signal loss and improve transmission quality. Flexible PVC outer jacket and strain relief design for optimal cable protection and a prolonged service life. Pearl Chrome Plated Metal Shell. 24 Karat gold plated contacts prevent corrosion for long-life optimum signal transfer. HQ Silver Series Toslink Digital Optical Audio Cable features a high quality fibre optic cable for superior signal transfer and gold plated tip for corrosion resistance. A flexible PVC outer jacket and strain relief design provides optimal cable protection and a prolonged service life. Profigold by Bandridge PGV782 high quality 1.5m flat cable scart lead. Enjoy crisp colourful pictures and high fidelity sound with this top notch interconnect and at an everyday price. 24k Gold Plated contacts ensures optimum signal transfer. 99.96% OFC conductor for high resolution picture quality. IAT interference absorbers for unmatched picture performance. What Video & TV best buy (May 2000 for 1.5m version). Lifetime replacement warranty against design, construction, material &manufacturing defects Perfect for audio and video connections between TV & DVD, VCR, Satellite receiver, Digibox etc. 3m 3.5mm 4 Pole Extension Cable TRRS A High Quality 3m 3.5mm male to female extension cable with 4 pole connectors. Moulded 3.5mm 4 pole connectors with nickel plated contacts. Ideal for hi-fi and audio applications. TRRS, Tip Ring Ring Shield cable. Profigold PROV5005 5m Composite Video Cable. PROV5005 24k Hard Gold plated contacts, for excellent protection against corrosion. Pearlized chrome plated metal connector with metal inner case, for maximum reduction of RF/EMI interference. Superior flexible outer cable jacket, avoids cable twisting and cable fracture. Color coded plugs with silver soldering, for easy installation and minimum transition resistance. Silver Plated 99,9996% Oxygen Free Copper conductors, for high speed full HD signal transmission. Superior large gauge conductors, for full performance up to 20 meters. Multiple shielding, for maximum protection from RF/EMI interference. High Quality PPE insulation, to ensure crystal clear sound and vision. Interference Absorption technology, to absorb electro Magnic and Radio Frequency interference. Integrated cable stopper, for optimal cable management. S-Video Extension Lead 1.5m, Premium Gold Plated. S-Video Extension lead, male to female s-video cable. 4 pin mini din s-video plug to 4 pin mini din s-video female. Gold plated connectors. Ideal for extending s-video cables S-Video cables support video only.